Will the young participants of the Red Bull Youth America’s Cup impact the future of the sport? Just ask three of the world’s most decorated sailors. “I think it already has had an impact,” says two-time America’s Cup Champion Jimmy Spithill of Oracle Team USA. “The winning New Zealand team from 2013 has graduated several sailors to Emirates Team New Zealand for this Cup, including the helmsman Peter Burling. Double Olympic gold medalists Roman Hagara and Hans Peter Steinacher masterminded the Red Bull Youth America’s Cup because they saw a gap in the career path for sailing talent. The solution didn’t lie in simply creating a regatta, but in providing training on sophisticated big boats. 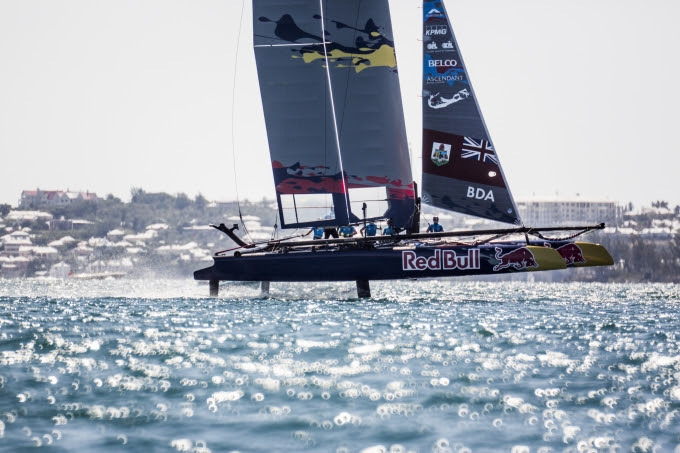 In the 2017 Red Bull America’s Cup, national teams have learned to sail AC45F foiling catamarans – the same boats used by America’s Cup teams in the Louis Vuitton America’s Cup World Series. What’s more, those senior teams have taken the youngsters under their wing. Sailing right under the noses of the top teams also gets young sailors noticed. In the lead-up to this year’s event, SoftBank Team Japan were so impressed with two of the candidates vying for selection in the youth regatta that they’ve already hired them for their professional effort. Steinacher points out that the sport’s leaders have seen that the young generation in particular are a great match for today’s cutting-edge boats. “The Red Bull Youth America’s Cup has changed the whole America’s Cup world – the age group that’s sailing on the boats dropped by about 10 years,” he reckons.